Cash Hole ATM Services Inc. is a locally owned and operated Portable ATM Company, servicing Edmonton and area. We provide standalone portable ATMs as well as trailers with up to three ATMs per trailer. Our ownership group has extensive experience working numerous special events such as fairs, rodeos, airshows, street parties, concerts, festivals, pop up sales and more. 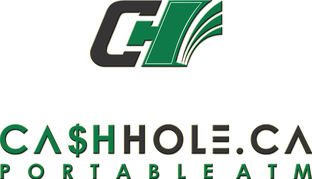 Copyright 2016 –All rights reserved Cashhole ATM Services Inc.